It’s the first Player of the Week honors for Zerboni in her NWSL career. 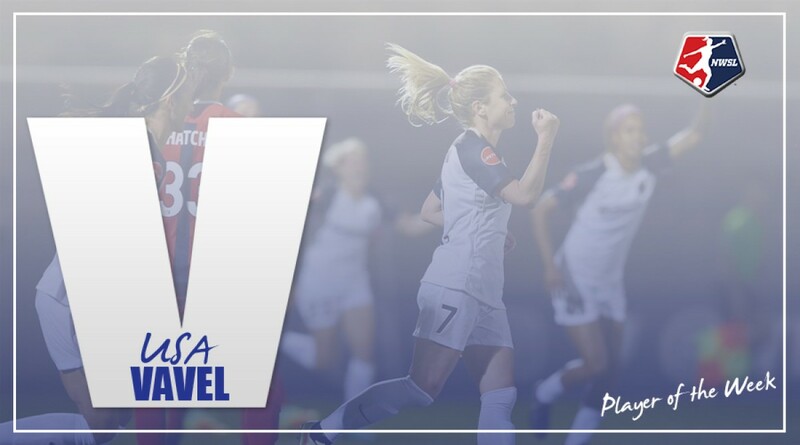 The NWSL Media Association voted North Carolina Courage midfielder McCall Zerboni as the NWSL Player of the Week for Week 3. Zerboni scored a brace this past Saturday against the Washington Spirit. The Courage went on to win 4-2. Zerboni's goals were her first of the season in her only two shots on goal in the game. Her first goal was on a free kick in the 24th minute for the Courage to take the 2-1 lead. Her second goal came in the 48th minute on another set piece. Defensively, the midfielder led the team in tackles (eight), interceptions (six), and total touches (81). Head coach Paul Riley praised Zerboni's performance post-game. "She's our emotional leader, you know, and our go-to player. We couldn't sort the pressure out and she came over after the first goal, she jogged over after the first goal and said, 'you know, we're struggling here, they're pulling us apart.' She's good like that. Instead of celebrating the goal she's coming over trying to fix the problem, and you respect that. She's a great leader. She's an emotional player. She's someone who keeps us going; scored two great goals tonight. The second goal off a corner kick. We worked on the corner kick yesterday, and to see that go in. Hammy got off on the front post quickly and was able to turn and it wasn't quite drawn up at the back post for McCall but it ended up getting there. It's good to score off set pieces."